The land gryphon leapt from the dark wood, grabbed one of the teenage boys by the head and bit it off with a sickening wet snap of its beak. The two other boys screamed and ran. Four older men, guarding the women and children and all armed with muskets turned to the noise. Another gryphon broke from cover and made for the large group. Two of the men fired; both inch-wide lead balls struck the creature in its feathered chest. The monster fell back, wounded, but not dead. The whole mass started to run, the two men who had fired stopped to reload before they also sprinted away. In a moment the refugees left the trees behind and entered an open area planted with potatoes. They saw their destination in the middle distance; the walled and netted village of Red Vale. The group slowed to a fast trot as each teenager picked up one of the younger children to help speed the pace and the older, armed men scanned the sky. A sky gryphon swooped down, its gold-colored feathers gleaming in the sun, the cruelly curved beak opened, its lion tail whipping back and forth. The beast plucked up a ten-year old girl carrying her baby brother. The four musket-men fired all at once, two of the rounds stuck the creature in the hind-quarters causing it to release its screaming prey. The girl dropped about three feet and fell, tumbling to the ground. She sprang up quickly. Both the girl and her little brother were scared and crying. The girl had three nasty cuts on each shoulder. The baby was unhurt. The group once again moved at a fast trot toward the village. As the refugees approached, the gates swung open and ten men, half armed with long pikes and the other half armed with heavy muskets, quickly came out and herded the newcomers in through the gates, which were promptly closed and bolted shut once everyone was securely inside. The village mayor ordered food and drink be brought, paying for it from his own pocket. The villagers knew the refugees, as their small farming community was just a few miles up the valley beyond the woods. “What happened?” the mayor asked as the tired and scared refugees ate and drank. The chief of the village Blues, Vanner Scott, dressed in his traditional mottled green-gray clothes, the empty right left sleeve pinned to the left shoulder, stood at the mayor’s shoulder. No one really knew, or remembered, why they were called Blues, when they always wore green and grey. “It’s been fifty years, or more, since the last attack,” another farmer added. “How many were there?” the Blues’ leader asked. “I saw five ground ones and one sky one,” Tosco answered between gulps of beer. The rest of the farmers and their families’ nodded, agreeing with that number. “Sky gryphons are supposed to lead land gryphons, again according to the records.” Vanner said. Vanner looked at the farmer calmly and said: “I didn’t know about any of this until just now. But you are right, it is my job to do something about it and so I will. You are all welcome to stay at the Blue Temple if you like, or at the inn. Temple funds will pay your expenses until you can get back to your homes.” With that announcement Vanner strode off toward the Blue Temple. Tosco Kellan was taken aback by the Blues’ leader’s generous offer and watched in silence as Vanner Scott walked away. The Blue Temple was indeed painted a deep blue. It looked like a prosperous town-dweller’s house; two stories, a large, enclosed back yard, all clean and well-maintained. The cadet at the door, dressed in solid gray jacket and white pants stood at attention as Vanner entered. The chief marched quickly through the great room on the first floor, through a door and down a flight of stairs. “Kyle, Jasco,” Vanner said as he entered the combat training room. “Father,” Kyle Scott said as he blocked a low kick from his sparring partner and pivoted into a high roundhouse heel kick. “Sir,” Jasco Hileah said as he slipped back from Kyle’s kick and then waded into his opponent with a flurry of fists, elbows and knees. All of which Kyle slipped or blocked, except the last one when Jasco over-balanced with a long jab. Kyle grabbed the extended arm, slipped his hip back and rotated, throwing his adversary over his shoulder. Jasco hit the mat with a loud slap. Jasco regained his feet and both young men bowed to each other. “I need to speak to Kyle alone,” Vanner said. “Sir,” Jasco said and he left, rubbing the back of his neck. Kyle nodded as he wiped his sweaty face on a rough towel. Vanner smiled and hugged the 18 year-old man. Vanner and Kyle went to the Blue Temple’s vast library. They read all they could find on gryphons. Then Vanner found a set of sketches of the monsters and showed it to his son. The artist had painted in color and put a human-sized figure in the frame to give a sense of scale. The ground gryphons were about eight-feet tall at their black-feathered, eagle-like heads, with long, black-feathered necks and chests. Their bodies were about nine-feet long with tawny fur from the front shoulders back to the lion-like tail. The front legs ended in eagle’s talons, while the rear legs ended in lion’s claws. 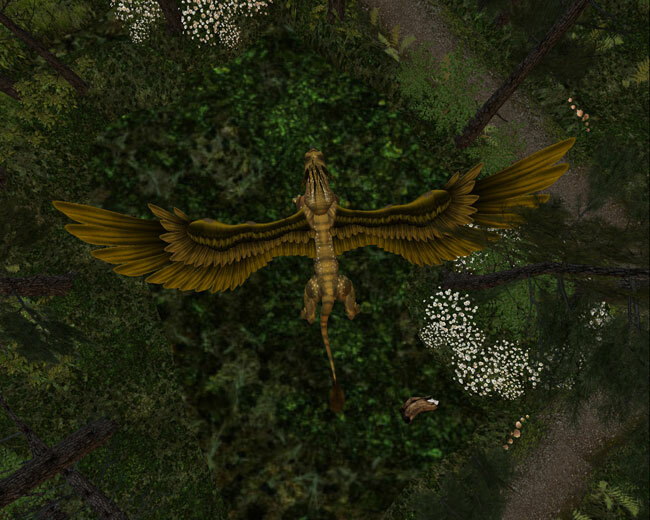 The sky gryphon looked the same, except for a larger head, the golden-feathered wings and a deeper chest. Vanner shuttered to think would it be like to face them in a fight with nothing but black-powder muskets and pikes. The next day the father and son went down to the deepest basement of the Blue temple in which the three hundred year old, green man-sized, metal casket sat. The phrase UNITED STATES ARMY: HIGHLY ADVANCED ARMORED SUIT, MODEL 2D LIN: A/A 19568-890-AC FEDLOG: MAN-9076-2063 was written across the lid. “Go on, open it,” Vanner said. The lid released with a loud click and a hiss of stale air. The two men removed the contents of the case and wrapped them in to several lumpy bundles. At just past noon on the second day after the monster attack, Kyle left the town through the south gate riding a pale horse and leading two pack-horses. The pack-horses were loaded with odd bundles and his pack of five well-trained and well-behaved dogs following on his heels. Vanner waved to his son. Kyle waved back and then rode south. Just in the wood line, out of sight of the town, Kyle pulled out a computer tablet and checked his position on the satellite map. He was only about two hours travel time from his target and had about four hours of daylight left. Wanting to approach in full dark, Kyle found a small clearing, hobbled his horses, set the dogs on perimeter watch and lay down on the ground for a short rest. Half an hour before sunset, Kyle’s computer tablet’s alarm woke him. He fed his dogs, horses, and himself, in that order. Then he put on his armor. Although the metal and high-impact composite combat-suit had been designed to be donned without help, it still required some uncomfortable twisting and great flexibility to put on. At last, Kyle slipped his camouflage cloak on and then settled his helmet on his head and was ready. It was full dark when Kyle finally moved out. He hefted his gear bag and started out at a quick trot. He left the horses behind, still hobbled and grazing on the short grass, but all the dogs followed him. The map on his heads-up display in the helmet guided him to the farm where the gryphons had first struck; while the helmet’s built-in night-vision gave him a clear view of the terrain and let him move swiftly and silently. On the reverse slope of the last hill before his target, Kyle halted. He took three padded frames designed to fit on a dog’s head out of his kit bag and gently placed them on his three scout dogs: Livia, Auggie and Puck. His two guard dogs, Herc and Amazon, waited. He petted his scouts and sent them over the hill. The three dogs moved silently and quickly, staying close together as they went down the hill and through the farmstead’s many buildings. The broadcast feed from their head-mounted cameras’ went back to Kyle’s heads up display. One of the monsters had knocked down the door and taken resident in the great hall of the main house. Two slightly smaller ones were at either end of the barn. A fourth was in the sheepfold and looked wounded with two streaks of blood running down its chest. They all appeared sound asleep; their eagle-heads tucked back to their lion-tails. There was no sign of the any others. Kyle called the dogs back. Ordering the dogs to stay, Kyle slipped over the brow of the hill, staying low and sticking to the shadows. His camo-cape color-shifted to copy background as he moved, making him nearly invisible. He passed through the smashed gate of a low wall and slipped into the main house through an open back door. Seeing his sleeping target, he flexed the two middle fingers of his left hand back to touch the palm, a forty-centimeter long, seven-centimeter wide carbon steel blade, sprung out of its sheath and locked into place. Slowly and carefully Kyle crept up on the gryphon and then in one swift, violent move, decapitated the beast. A huge gush of blood shot out of the neck, then dribbled to nothing. Kyle picked up the severed head which had rolled a meter away. He opened the dead monster’s mouth and lifted its tongue; a series of Chinese characters and Arabic numerals had been tattooed in its mouth. Kyle’s armor automatically translated the characters: “Chinese Academy of Genetics and Bio-Engineering. Land Combat Model: LG-300. Serial Number: 76-9463-A.” Kyle breathed a small sigh; Chinese models were supposed to be somewhat less difficult to deal with than Russian ones; a little slower and slightly less aggressive. Kyle moved stealthily out of the smashed doorway toward the sheep-fold, carefully scanning for any hint of movement. The wounded beast appeared to be fitfully sleeping, twitching and making a low growl. Kyle stepped up to cut its head off when it sprang up in one singular motion. He slashed the creature’s chest instead of its neck and got his blade caught between two of its ribs, so that even the augmented strength of his armor could not pull blade free. The gryphon let out a loud, bird-like cry, bit down on Kyle’s left shoulder and picked the armored figure up. “Hell!” Kyle shouted aloud, as he kicked and struggled. Holding his right gauntlet as far back as possible; Kyle made a fist with his right hand. In just a second two-hundred 4.5 millimeter hyper-velocity pellets shot out the gun mounted on his right forearm. Blood and tissue splattered on Kyle’s face-plate as the rounds dug into the gryphon’s flesh. One pellet finally hit something vital and the creature dropped its attacker, gave a pitifully weak squawk and fell over. Kyle put his foot on the beast’s neck and wrenched his blade free, and then he quickly sliced the gryphon’s head off to ensure it was dead. He pulled a cleaning cloth from one of his many pockets and in one swipe completely removed the blood and body tissue from the vision ports. The human hunter then turned and sprinted for the barn, hoping to catch the last two identified targets still asleep. No such luck, both monsters were awake and heading his way. With no more reason for stealth, Kyle hit a switch by lowering his chin; this brought his shoulder mounted tri-barrel into operation. The brilliant bullets in the weapon locked on the nearest beast and gave a satisfying set of loud beeps in Kyle’s ears. He bit on the trigger and heard three distinct chuffs as the weapon fired. All three bullets impacted on the gryphon’s chest and exploded, sending its head and neck flying up and away while the rest of the body dropped to the dirt. The lagging gryphon had closed on Kyle, so he engaged with his hyper-v gun. The creature cried out as the pellets tore at its neck and chest. The monster fell dead about five meters from Kyle. The armored man moved forward carefully and checked that the fallen creatures were indeed dead. Suddenly, he felt something grab his right leg, lift him up and fling him through the air. Kyle curled into a ball as he flew. He landed on his back and rolled to absorb the impact, then sprang to his feet, his right arm up ready to fire. The last land gryphon was right on top of him. The monster bit down on Kyle’s right forearm before he could fire. Kyle felt the bones snap as his armor crumpled under the pressure of the gryphon’s bite. Before he could even curse, the suit injected a local pain-killer, locked its elbow and wrist joints in place and filled the forearm space with healing-foam to stabilize the broken arm. The gryphon yanked him off the ground by his damaged arm and began to shake him like a cat with a mouse. Kyle could feel the bones in his arm grinding together, even with the pain medication, he nearly fainted from the torment. Kyle couldn’t even bring his blade around to stab his tormentor. Then, for some reason, the monster dropped him. He landed on his feet and turned. His dog pack had disobeyed him and were attacking gryphon. Herc and Amazon had each grabbed a back leg and were pulling and biting them, while his three scouts, barking loudly, leapt in to bite its front legs while dodging the creature’s deadly beak and talons. Before he could react, Kyle saw Puck get slashed across his back, badly wounded and out of the fight. Unable to use his high-V gun or his tri-barrel for fear of hitting his canine friends, Kyle jumped, hooked his broken arm around the creature’s neck, causing another wave of pain to roll over him, and began to stab at the monster’s face. One well-placed strike punched through the creature’s left eye and into what passed for its brain. Without a making a sound, the gryphon dropped over. Kyle pulled his blade out and rushed to Puck. As he petted the wounded dog, he sprayed healing foam on the injury from a dispenser in his left palm. The wound looked serious, but not life threatening. The foam stopped the bleeding while treating for pain, infection and shock. Suddenly, all the dogs looked up and howled. Kyle looked up too and saw the sky gryphon silhouetted against the just risen moon. He dropped flat on his back, locked his tri-barrel on the shape and fired six brilliant rounds. Two struck the dodging, weaving monster on the left wing; a third took off its right rear leg. The monster fell, tumbling from the sky. Kyle scrambled to his feet and race toward his fallen enemy. All his dogs followed, including the wounded Puck. “Pleasssse shhhoooottt meeeee.” Kyle heard as he approached the wounded creature. The sky gryphon lay on its right side, its wing trapped under its body, the left wing gone, its body shredded by shrapnel; bleeding badly. “Why you huntts usss?” it asked. The sky gryphon gave a finally rattling breath and died. Kyle could not remove his armor with a broken arm, nor did he want to, so he left it on. He couldn’t ride wearing the HAAS so he walked. Kyle put Puck across one of the horses so the wounded dog didn’t have to walk. As he led his horses and dogs slowly back to Red Vale every step he took, his arm and shoulder burned. His father was waiting at the south gate and went with Kyle back to the Blue Temple. The older man sent one of the cadets for the medicos. In the temple Kyle rolled the six gryphon heads out of the blood soaked sack as proof he had killed them all. The older man gingerly helped his son remove the HAAS suit and put it back in the storage case. Kyle said not a word the whole time and responded to the bone-setting with no more than gritted teeth. “How was it, son?” Vanner finally asked as the medico left. “Awful and exciting,” Kyle the Quiet said as lustrous tears rolled down his cheeks and he hugged his father again. Patrick S. Baker is a U.S. Army Veteran, currently a Department of Defense employee. He holds Bachelor degrees in History and Political Science and a Masters in European History. Writing professionally since 2013. His nonfiction has appeared in Medieval Warfare Magazine, Ancient Warfare Magazine, Sci Phi Journal, and New Myths. And his fiction has appeared in Sci Phi Journal and Aurora Wolf as well as the King of Ages, After Avalon, and Uncommon Minds anthologies. In his spare time he reads, works out, plays war-games, and enjoys life with his wife, dog, and two cats.